Join Studio Steve, and his motivational robot sidekick, Wheatherby, as they walk you through audio production basics that will have you podcasting like a pro. Enjoy quick and simple episodes that focus on achieving great sound. And listen to special guests disclose tips and tricks on growing your podcast empire. We have asked many podcasters what they struggle with the most and a vast majority express wanting to reach a bigger audience and find more listeners. Content Repurposing is a direct solution to that concern. During this informative interview with the founder of Content 10x, Amy Woods chats with us about the Content Repurposing basics and practices. Join Veronica and discuss planning, structuring, and creating your podcast episodes. Scripted VS Unscripted. Episode format and frequency. Thesis and talking points. Intro and Outro. Script writing tips and tricks. Welcome to Season Two Podprenuers! This is another season for beginners. We are going to cover all sorts of fun topics. Microphone technique. Finding your podcast persona. The art of interviewing. Remote recording. Content re-purposing. Compression. EQ. Mixing. And more. A short and sweet discussion on Digital Audio Workstations, or Audio Editing Software. Studio Steve helps to choose which one to decide on using for specific situations and budgets. Let us know how your show development is going. Tell us when you’re going to start recording or when you’re scheduled to launch. Is it possible to make a podcast for free? What is the cheapest and quickest way to get started? Studio Steve answers these questions and chats about podcasting on the cheap. He covers: Computer, USB Microphone, Free DAWs, and Free Web Hosting. On this quick episode Veronica chats with us about considerations and thoughts when choosing a title for your podcast. Although this can be very tricky, it’s also one of the funnest parts of the planning process. She shares many helpful ideas that are good to think about before writing that sweet name in permanent ink. Associate Research Fellow, Veronica, chats with us about Finding Your Podcast Target Audience. This is an especially important aspect of planning and preparation that is often overlooked. Finding your niche can not only have you launching your show with a bang, but it will also help when creating your content. Grammy Nominated Audio Engineer, Matthew Weiss, is the content provider for The Pro Audio Files, the recordist & mixer for Akon and Konvict Muzik, and the head engineer at Konvict Studios in Burbank, CA. On this Bonus Episode Matthew shares some pro tips for podcasters. We talk about microphones, interfaces & DAWs, preamps, compression, EQ, and more. YouTube expert and Marketing Strategist, Jessica Stansberry shares some tips with us about Marketing and Sharing our podcasts. Check out her YouTube channel for tons of helpful videos. Learn the difference between consumer speakers and studio monitors. We discuss setting up and using your Studio Monitors correctly to achieve good mixing results. Then we finish up by covering the easy to overlook accessories. Not only are accessories more expensive that we’d like to think (or plan for), but there’s also nothing worse than setting up to record, only to realize you’re missing a small do-dad that makes the whole process work. The Audio Interface is the Boss of your computer recording system. We cover the basics of common audio interfaces. Preamps, A/D Converter, Sample Rate & Bit Depth, MIDI, Ins & Outs. Does that sound like a lot? Don’t worry, it’s really simple once you break it down. Learn the difference between Dynamic and Condenser Microphones. We discuss the basics of how microphones work and what you’ll need to know to be able to use them properly. Your microphone is one of the two most important factors in achieving professional quality audio. A fun crash course in Audio Acoustics. We cover the physical properties of sound and how those sound waves behave in your podcast studio. Then we finish up the episode by discussing Noise, and Sound-proofing & Room-Treatment. Having a basic understanding of Acoustics is the first step in achieving great audio. Before diving into audio production, we take a minute to talk about the many other aspects of planning for a podcast. We make a quick checklist to help you get started planning: Choose Your Niche and Your Topic, Your Show Title, Create Your Artwork, Recording Gear, Find Your Web host, Episode Frequency and Format, and Launching and Connecting. 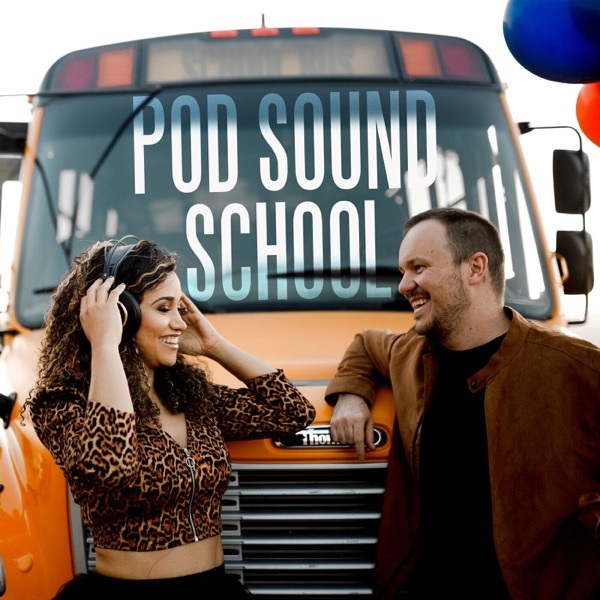 Meet your host, Studio Steve and his assistant Weatherby, as they introduce you to the curriculum of the Pod Sound School. This quick episode summarizes what to expect from the first Season. Season one is dedicated to the beginner and starts with audio basics. While providing a crash course in audio production, It will also help newcomers to podcasting make informed purchasing decisions. Hit that SUBSCRIBE button podskis! And check back March 13th.